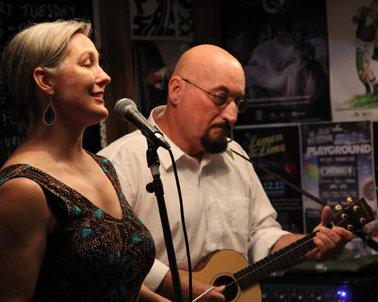 Songs of shadow and delight — Daylight Moon plays originals, and original interpretations of classics from the folk, pop and rock genres, with just a dash of jazz. Helena’s voice soars and dances, Ross’s hands chug a rhythm or fingerpick a countermelody from uke or guitar, as showcased on their two albums (2013, 2016), and in gigs and festivals in eastern Australia, and Northern Ireland. That was a fun gig—just ask them. But not before you join in, learn the new words to an old favourite for the set closer!